The influence of Flemish art was a shared feature among the wide variety of artistic styles and regional schools within 15th-century Spanish art. This influence led to the creation of a new, characteristically Spanish style that prevailed in the second half of the 15th century known as Hispano-Flemish art. The Catholic Kings played an important role within the development of this trend, reflecting their own artistic preference for the realist art of Flanders. Artists such as Juan de Flandes and Michiel Sittow, both in the service of the Crown, fulfilled the royal requirements for portraiture at the end of the century. Aware of the importance of their image, the monarchs had their portraits included in religious works such as the celebrated Virgin of the Catholic Kings (Madrid, Museo Nacional del Prado), and in others such as the panels of Ferdinand the Catholic (Vienna, Kunsthistorisches Museum) and Isabel the Catholic (Madrid, Palacio del Pardo), in which the religious context has been omitted. The present portrait, attributed by Friedländer to Juan de Flandes, can be compared to the pair depicting Juana of Castile and Philip the Fair in the Kunsthistorisches Museum in Vienna. As Elisa Bermejo noted, the manner of painting the backgrounds is similar both with the regard to the colour and the distribution of the shadows. The similarities between the present sitter and that of Juana de Castile are evident, which could be explained if they were in fact mother and daughter. A date of 1496 has been suggested for the present panel when the Infanta Catherine, who was born in 1485, was eleven. This date seems appropriate to her appearance and to the style used by the artist at the end of the century. However, this identification is not absolutely certain. It has also been tentatively suggested that the sitter is Juana of Castile, while other authors have preferred to describe this portrait simply as a “Portrait of a Girl”. A portrait by Michiel Sittow in the Kunsthistorisches Museum, Vienna, has also been proposed as an image of Catherine, in which the young girl is depicted as a saint with a halo but with features that suggest a specific sitter. However, that painting by Sittow and the present work are not particularly similar. Santiago Alcolea suggested that the present portrait depicts María, another of the Catholic Kings’ daughters. Born in 1482, María married Manuel of Portugal in 1500 and was fourteen when the present work was painted. Aside from the identity of the sitter, the present panel is one of Juan de Flandes’ most beautiful images. The fact that the sitter holds a rose in bud has led to a variety of readings. Sterling interpreted it as the symbol of the Tudor dynasty (Catherine married Arthur, Prince of Wales, in 1501). Elisa Bermejo considered the flower to be an attribute related to the sitter’s young age. The third interpretation suggests that this image is a marriage portrait. The painting’s date of execution corresponds to the period when the nuptial strategies of the Catholic Kings brought Spain closer to Portugal, in which case there are some grounds for accepting the idea that this is a portrait of the Infanta María, the daughter chosen by the Catholic Kings to make a Portuguese alliance. The oval face is softly constructed and defined with delicate lights and shadows that increase the sense of volume. 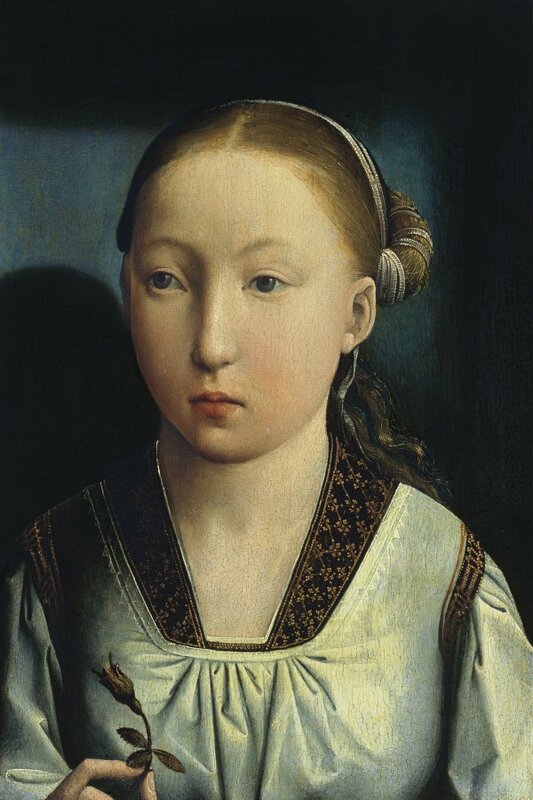 The young girl conveys a sense of dreamy gentleness typical of Juan de Flandes’ style. Finally, the index finger and thumb of the right hand are drawn with typical elegance. The painting was previously in the collection of the duque del Infantado. It was in the Thyssen-Bornemisza collection by 1930 when it was included in the exhibition at the Neue Pinakothek in Munich. There is a replica in the University of Santa Barbara Art Museum, California.